Occasionally through your life-time you may be fortunate enough to meet a person with whom you immediately feel an enormous connection. I don’t necessarily mean a romantic love type of connection, but something maybe even deeper, more spiritual or soulful. There is an instant bond between you that belies the actual length of time you have known them in this physical existence. It is difficult to explain the overwhelming affection, fondness and sense of pure freedom you feel when you are with them. The freedom when you know, totally, that you are accepted and loved for who you are, not how they perceive you to be, or how you may usually portray yourself, but just exactly as you. It is a strange feeling of being stripped bare. You know that this person knows you to an extent that very few ever will. I felt so blessed to have met my very dear friend Janet. We met at a creative writing class in Bideford, North Devon. From the moment I saw her I recognised her, but not in the way she looked, more in the way she just ‘was’. There was a familiarity that I had never really felt with anyone apart from my own family. It was wonderful and odd all at the same time. After the first class she asked me if I would like to join her for a coffee. I didn’t hesitate, it was as if I needed to know more about her. Not just a passing inquisitiveness, it was almost a pull from the depth of me, I felt I had found someone who I knew would play a uniquely special role in my life. We couldn’t stop talking and before we knew it several hours has passed. We both expressed how from the very first moment we met we felt we had known each other forever. Janet said that she felt I was her daughter or her sister in a previous lifetime and I could completely understand what she was saying. The thought that she was my Mother resonated more with me, although at the time I still had my own wonderful Mum alive and well and living with me! My heart felt the same emotion of attachment that I felt for my Mum, but in an even deeper sense, which on the face of it was crazy as I had only known Janet since that morning. Our friendship grew and we enjoyed our times together so much. We never ran out of anything to say. We would have times full of laughter and sunshine and times of intense conversations about anything and everything. The honesty between us was extraordinary. The trust was implicit. I had never known a relationship like it. Very strangely, when we compared notes, we had lived within a few miles of each other several times during this life time. This would have been odd if we had always lived in the same town, but both of us had lived in several counties over the years. When we met we were both living in North Devon, she was in Bideford and I was living in a small village a few miles away. Amazingly though, years earlier, when I had lived in one property in Exeter, the view from my kitchen window was actually Janet’s house! We both felt that it was far too much of a coincidence and that we were destined to meet. 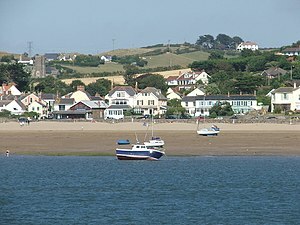 We would often go for a coffee at a quaint pub, The Boathouse, overlooking the sandy beach at Instow in North Devon. It is a small village off the tourist route with the most glorious sand dunes and views across the estuary to Appledore, a picturesque Devon village with pastel coloured cottages dotted along the waterfront. We would sit in the window of the pub and watch the sun cast its shadows over the green hills behind Appledore and watch the sail boats wafting by. We would sit and discuss our spiritual experiences, our thoughts and our understanding of the greater picture of life. She was totally convinced that we had shared many lifetimes before and that was why the bond between us was so strong, and the more I got to know her, the more I tended to agree. Our experiences and our perceptions on life were far too similar. After our coffee we’d normally go for a walk out to the water’s edge, and then wander along the seafront back to the car park. Janet never once complained about my limited ability as I was not able to walk too far, but with rests on benches along the way I still managed to enjoy our walks. She was very slim and what I would call ‘super fit’. A keen surfer and swimmer, she had joined the local gym when she had moved to Bideford, and thought nothing of going surfing for a few hours then back to the gym to do even more exercise for a couple more hours. Her idea of heaven was to go on a hiking holiday around the islands of Greece or in the highlands of Scotland. One cold day in mid February, we had enjoyed a warming cuppa at The Boathouse, and having wrapped ourselves up in scarves, hats and thick gloves, we started walking out towards the sea. In a very short time Janet became unusually tired, she suddenly looked extremely pale. She told me she thought she might be coming down with a virus and so we turned around and headed back to the car. I drove her home and was concerned because she really didn’t look at all well. I asked her to go to the doctor and she reluctantly agreed. I went home and felt uneasy all afternoon. Just before dinner Janet rang me, and I was so relieved to hear her voice, but I was shocked by what she told me. She was in hospital. The doctor had checked her heart and it was so slow he had called an ambulance immediately. Janet explained that the consultant she had seen had told her that she would be having a pacemaker fitted the next day. I was stunned by the news, but so pleased she was in the right place. The following evening I went to visit her in the hospital and she was sitting on her bed looking happy and healthy. Her colour was back to normal and she said she felt great. She was laughing and telling me she had new rules to follow now that she had an electronic addition. She said she couldn’t go through a security scanner in an airport, couldn’t stand next to a microwave and also that she would have to have the pacemaker removed if she wanted to be cremated when she died. Within a couple of days she was home and you would have never known she’s had anything wrong with her. We resumed our walks on the beach and Janet carried on with her swimming and her gym workouts. The only deference to her surgery was to give up the surfing until it was warmer. The hospital was delighted with her progress and she didn’t appear in the slightest bit concerned about having a pacemaker. She was excited as she had just booked a hiking holiday with her brother. They were going to Greece in later summer and were going to walk several miles along the coastline over the course of a few weeks. She had thoroughly investigated the whole walk they were to undertake and was especially thrilled that it would culminate with a world-class opera performance in an open air amphitheatre. I was at home in early March when I received a very distraught phone call from Janet. She was at the hospital for a routine post-procedure check up to ensure that the wires of the pacemaker were in the correct place. Part of the appointment was a chest X-ray. She was told to sit and wait whilst the consultant checked her results and had been quite happy waiting as she was an avid reader and had taken a good book along with her. She was obviously distressed when she rang and asked if I could go straight to her home to meet her when she returned from the hospital. She said she didn’t want to talk about it from the hospital phone. As soon as I saw her I just knew she was dreadfully worried. She told me that the consultant had called her across to his desk and told her quite bluntly that he was seriously concerned with her X-ray and had made a further appointment with a chest specialist for the following morning as he felt something was majorly wrong. With that unexpected news she was just given an appointment card and had been left on her own, absolutely bewildered. She asked me if I would go with her the next day and of course I said I would. We arrived at the chest department and were told to wait in a huge and very full waiting room. Janet, who was normally such a confident and positive person, looked so nervous. I prayed that the wait wouldn’t be too long. She had already spent the whole night worrying about what may be wrong and said she had hardly slept, which wasn’t at all surprising. Within just a few minutes we were called into the consultants office. He had Janet’s chest X-Rays on a large illuminated board on the wall. He was much kinder than the doctor she had seen the day before and very gently explained to her that both her lungs showed metastasis. He explained that she must have a primary tumour somewhere in her body and that the cancer had already spread to her lungs. He told her that even if they found the primary site the secondary cancer had already spread too much for them to cure her. It was a massive bombshell. Janet sat quietly, hardly uttering a word, visibly shaking, with a look of fear I had never seen before. He also said that even though he could offer chemotherapy it may only give her a few extra weeks and that the quality of her life would be reduced because of the treatment. She immediately said that she wouldn’t take that option. He went on to explain that if she was fortunate she may have three months left to live, but he couldn’t guarantee that. I felt utterly useless, there was nothing I could say or do to help her other than just being there. With the words of the consultant still fresh in her mind it was evident that Janet was a crushed soul, I had to support her physically as we walked back to the car. I drove to a little pub overlooking the sea and we sat outside in the fresh air away from everyone. For the first time since I’d known her she sat drinking brandy after brandy. She was shaking so much she could hardly hold her glass, all I could do was hold her hand and tell her that I would be there for her. We were both in a huge state of shock. It felt unreal. It was such a dreadful sad day. I sat looking at my darling friend, such a beautiful person. I was desperately trying to keep my own emotions in check, but failing miserably. We hung on to each other, just sobbing and sobbing. I couldn’t bear the thought of the pain and heartache that she faced and I couldn’t believe that my wonderful Janet was going to be leaving me. We had only known each just over two years and yet we truly were kindred spirits. Over the next couple of months we spent an enormous amount of time together. Janet’s appetite began to fade and the weight was falling off her already slender frame. Braeburn apples became her favourite food and every time I visited she would ask that I bought her some. I had never heard of them before, but it was so nice to see her enjoy eating, even if it was just fruit. Her eyes gradually became sunken and her breathing laboured. We were fortunate to enjoy an unseasonably warm spring that year and spent much of the time sitting in her garden overlooking the countryside, watching the young lambs playing in the fields. In her last weeks we discussed the afterlife and who would be meeting her, where she would be in the future and when we might meet again. Just days before she passed to spirit she unexpectedly gave me a present, a book, The Alchemist, written by Paul Coelho. She told me it was important that I read it. I took it home, put it on the bookshelf and promised myself I would read it in the near future. Janet’s brother and her two sons were visiting her over the weekend and I phoned her on Saturday, but could get no reply so had left her a message. I had a prior engagement that evening and it wasn’t until the following morning that I checked my answer phone. There was a beautiful message from Janet, spoken in short phrases between her gasps for breath. She told me that she was sorry she’d missed my call but that she’d had a good day and that we would talk soon. She also told me that she loved me. I rang her straight away and her brother answered the phone. He was obviously upset and told me that Janet had died only a short while before I rang. He said she had suffered a heart attack and that it was almost instant, and most importantly that she had not been in dreadful pain. I put the phone down and just cried for hours, my heart-felt it had been ripped apart. Even though I knew she was terminally ill, and I honestly thought I was prepared for her death, when it came to it I was not at all. I had somehow convinced myself that she would still be around. How could someone as vibrant and intelligent and funny and loving as Janet suddenly just not exist anymore? How cruel. Life made no sense to me at that time. I felt lost without her. Many years later I had a friend, Trudie, staying with me. Trudie was a very good medium and worked as a communicator for spirit both privately and within the spiritualist church, often demonstrating her mediumship at services. She walked into my bedroom one morning and just said “A woman is telling me braeburn apples and her name is Janet, does that mean anything to you?” I was absolutely delighted because I hadn’t heard from Janet since she had passed to the spirit world. “Yes”, I said, “it makes perfect sense.” “Well”, said Trudie, “she is telling me that just before she died, the two of you were sitting in her garden in the sunshine”, “Yes” I replied, “and she is telling me that she gave you a present, a book”. I was astounded at the accuracy of Trudie’s reading and confirmed what she was saying. “She is telling me that she told you it was important that you read the book, is that right?” she asked, “yes” I said, “I remember that well”, “She is telling me that you still haven’t read it and that it is even more important that you read it now”. Wow, I thought, this was incredible. I spoke my thoughts aloud, knowing that Janet could hear me. “I promise I will read it” I said. She told Trudie to give me her love and then just went. It was the shortness of the message that also spoke volumes to me because that is exactly how Janet would have said something she considered important when she was alive. The next day, after Trudie left, I found the book and started reading. I couldn’t put it down. I could see why Janet had been so insistent that I read it. The book was wonderful and inspired me to look at where I was on my spiritual pathway, which spiritual teachers had been placed in my life, and most importantly, to recognise my destiny and follow my dreams. I was aware of Janet as I continued to read it, I could sense her approval, and see her twinkling eyes and her wonderful smile. Due to personal circumstances in my life I had been ‘away’ from anything spiritual for a long while. Her contact had come along at just the right time. I was sure the message was a huge nudge to get back on my rightful path, as if she was saying “about time too, come on, get on with it!”. I know Janet ‘s spirit is with me and that she is supporting me towards living my dream and pursuing my pathway. Most importantly our friendship and our love lives on, we will always be kindred spirits. A touching and beautiful story . . . and thanks for connecting with my blog as well. Thank you so much for your comment. Yes, loved your blog .. will be an avid reader! Love this… thank you for sharing. I purchased the Alchemist in August of 2010 and have yet to read it… I am now newly inspired! sad but an amazing story,that janet made cotact again with you…..
i just have to believe they are happy ,now,and i do….but i would love to hear from just one…. Thank you, I am so very lucky to have her in my life!